Movable do, also called tonic sol-fa was developed in England during the 19th century (source). Fun Fact: solfege syllables are based on an old Latin hymn where the syllables do, re, mi, etc. fall on their corresponding pitch. Movable do (created by Sarah Ann Glover) situates melodies in a tonal context, focuses on the relationship between notes, and helps develop a more comprehensive understanding of music. It should be noted that when using the movable do system, more complex music may require prior analysis, especially for key areas are ambiguous. Overall, solfege is a useful and beneficial tool for developing sight-singing and music-reading skills and understanding music and tonal relationships. It also promotes good vowels when singing, as each solfege syllable is a pure vowel sound. Solfege is often associated with the Kodály Method, based on the work of Zoltán Kodály in Hungary during the mid-20th century. Kodály advocated for "sound before sight" and introducing new concepts through listening, singing, and movement. The Kodály Method incorporates rhythm syllables and rhythmic movement (based on the work of Émile Jacques-Dalcroze), Glover’s movable do solfege, and John Curwen's hand signs (Kodály added the upward/downward movement where do falls at the waist and la at eye level). Start with warm-ups. This is a great way to introduce solfege to your elementary-age choir. Use a simple sol-mi pattern or expand it to sol-mi-do or a descending 5-note scale (sol-fa-mi-re-do). Use call and response patterns to develop listening skills (try choosing tonal patterns from a new anthem). Call on a few children to be leaders and sing a pattern for the group to echo back. Play a solfege game. Children love Secret Pattern (also called Poison). Choose a one-measure tonal pattern (e.g. sol-mi-sol). Sing it for the children and tell them it's the secret/poison pattern. Then, perform a series of other tonal patterns with the children echoing back. Sing the secret/poison pattern - if anyone echoes back, you get a point. If no one echoes, the children get a point. See an illustrated version of this progression here. If your choir is beginning to read music notation, hold up a few tonal pattern cards or write 2-3 patterns on a white board. Sing one and ask the choir to tell you which one they heard. 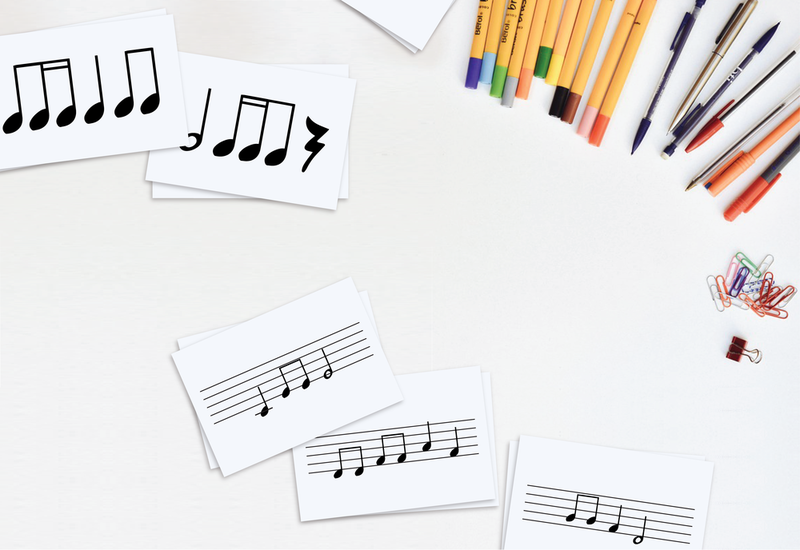 If you have a little more time in rehearsal, try letting your older children's choir compose a short 4- or 8-bar piece using tonal pattern cards (this could also be a fun gathering activity). Teach the melody line of a new anthem by having your choir sight-sing individual tonal pattern cards, then piece them together into a phrase. Body solfege is a fun, effective way to teach solfege to young children and it incorporates a little movement into your rehearsal! See printable posters below. Reinforce this concept with the Balloon Song, using notes of the C chord. The Curwen hand signs are a useful, practical way to help teach the solfege syllables and their relationship to each other. For instance, the sign for fa is a closed fist with thumb pointing down because the tendency of this note is to go to mi. See printable signs below. Do you use solfege with your children's choir? How do you incorporate it into your rehearsals?